This sweater has been anything but a Lady and I’m growing frustrated for the first time in my short knitting career. Lace socks? No problem. Lace scarf? No problem. Stupidly simple worsted weight lace sweater? Problems up the wazoo. Stitches keep disappearing–always in the same part of the sweater. Can not find them ANYWHERE. They’re not dropped. No accidental p2 togethers. They keep disappearing like Jimmy Hoffa. Maybe they’re keeping him company. Yo, Jimmy, I want my stitches back. I am knitting so slowly right now, so deliberately, that this project will take forever compared to ones I’ve done much more quickly. There are not enough words to express just how vexed I am. I really wanted to get this done before my daughter is born, but at this pace? I might be done with the body by then, but definitely not the whole thing. I am having a rare day where I wish I were a drinker. What pretty yarn! I thought I lost some stitches, too, but then I realized that I missed some of the yarn-overs. After a few rows of the lace pattern, I placed markers every 7 stitches and counted before continuing. This was somewhat tedious and frustrating while knitting, but I feel sooo happy and satisfied now that it’s done. It is definitely a pattern that demands full attention. Good luck! 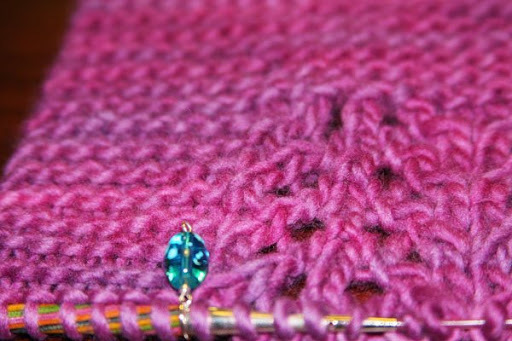 Jen, it’s Malabrigo worsted in Hollyhock. :)Pumpkin, my lace pattern is turning out A-OK, looks just fine, which makes it all the more vexing that I have stitches missing. I’ve never had an issue with not being able to find them before. I can usually read my knitting very well and this time, pfft.